With its delectable recipes and charming girl-next-door tone, Homemade With Love is sure to be a welcome addition to the kitchens of longtime readers of the blog, uIn Jennie's Kitchen. 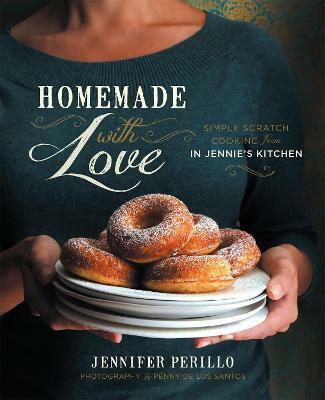 /u Jennifer Perillo has long written on the pleasures and importance of cooking from scratch, buying local, and eating at home. Jennie shares her love for her farmers' markets and local purveyors while dishing out a hearty dose of practical culinary know-how for the working parent,or any busy cook. Jennie has been writing online since 2006, and developing recipes for more than 15 years, even after the sudden death of her young husband, Mikey, in 2011. Gathering her family together around the table was her recipe for healing though many things about her life have changed, her commitment to eating for nourishment,physical and spiritual,has not. A seasoned recipe developer and personal chef, Jennie has crafted shortcuts (like two homemade all-purpose baking mixes, used as a base for baked goods such as breads, muffins, and cupcakes) to make good eating just a little easier. Try recipes like Orange-Scented Waffles, Carrot Fennel Soup, Lentil Ricotta Meatballs, Drop Biscuit Chicken Pot Pie, Strawberry Blender Sherbet, and Lemon Buttermilk Doughnuts. Simple, soulful recipes for every meal of the day emphasize farm-fresh produce and whole foods. Jennie's distinctive voice is an evangelist for eating close to home, lingering around the table.